I tend to get my fresh vegetables on Tuesday, so by the time Sunday rolls around, I’m down a lot of produce. I wanted to make something yummy for dinner, but the only fresh veggie I had was an eggplant. My husband has undertaken a massive pantry operation (we have synched eLists and everything now), so I knew I had lasagna noodles, canned tomatoes, and pine nuts in with our non-perishables. I’ve been wanting to play around with the idea of rolled lasagna for a while. It’s fun, easy, and not as messy to serve. I’ve found that vegan lasagna falls apart even more readily than its dairy counterpart since it doesn’t have solidifying cheese to keep it together. 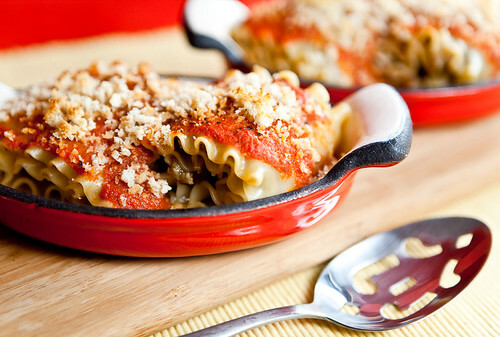 Rolled lasagna holds its shape marvelously and it’s attractive. 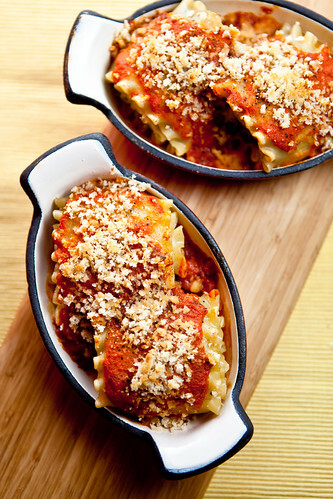 It’s also a great way to make smaller portions of lasagna, if you don’t want a huge casserole dish full of it. I baked mine in gratin dishes (you know me and individually portioned food). You can just as easily bake this in one large dish; there shouldn’t be a difference. You can also fill them with whatever you like. I think sundried tomatoes, spinach, mushrooms, roasted peppers… any of those would be a fabulous addition. I’ll add some possible variations to the recipe below. 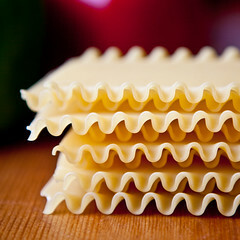 Boil noodles in salted water until al dente. Drain and lay out the noodles on a cookie sheet, lightly spraying with oil so that they do not stick. Set aside. Peel eggplant. I find the easiest way to do this is to cut off both ends and use the edge provided to get your vegetable peeler started. I’ve found it difficult to get the peeler to cut the skin otherwise. Place the eggplant upright on the cutting board. Slice the eggplant in long, thin vertical slices. Then slice each of these in half again, also vertically. Sprinkle with salt and pepper. 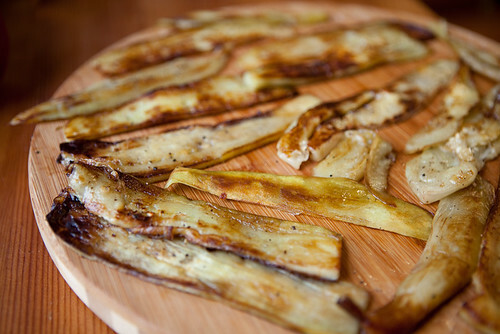 In a large non-stick or cast-iron skillet, begin browning the eggplant strips in olive oil, 2-3 Tbs a batch (or more). 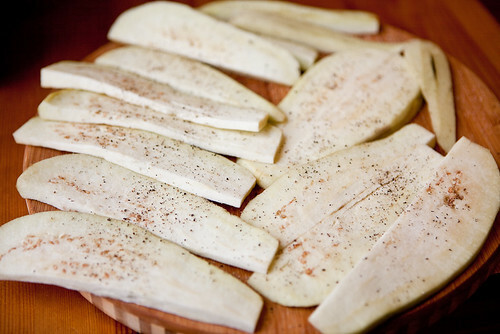 When strips are very tender and nicely browned on both sides, set aside. In the hot skillet you cooked the eggplant in, add the pine nuts. Toast the pine nuts over medium-low heat until golden brown, being careful not to burn. Add the pine nuts to the work bowl of a food processor. Grind the nuts as well as you can, then add the remaining ingredients for the pine nut spread. Process until well combined. Toast the bread and process into breadcrumbs. Spread a little pine nut spread ontp each noodle. You don’t need a lot, it’s very rich! 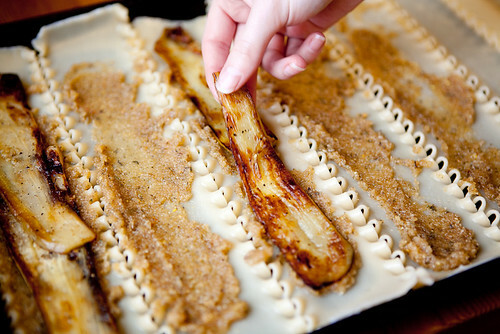 Add eggplant strips, as well as any other filling. 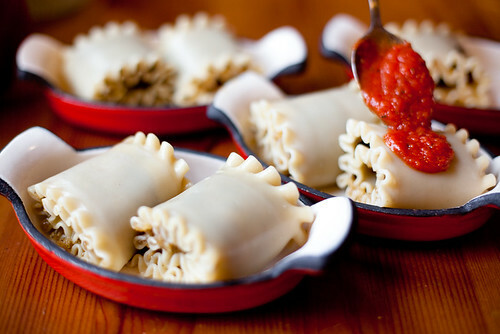 Roll up each noodle and place in your baking dish(es) seam-side down. Cover generously with sauce. Top with breadcrumbs and bake for 20-25 minutes. Since everything is already cooked, they just need to heat up and slightly brown. If you’re baking them in individual gratin dishes as shown here, place all the dishes on a baking sheet for easier removal from the oven. Serve immediately! Making the sun dried tom version as I type! LOVE this dish. I look forward to every leftover piece. Any advice on how to get the pine nut mixture to spread? The best I can do is flattened clumps dotted down the noodle. I made this tonight and I am still very full from it. The pine nut spread wasn’t very spready but still very good. I had some leftover and I’m keeping it to sprinkle on things. I passed out for 2 hours after eating this after work! Any luck replacing the dried Italian herbs with fresh ones? I made this last night for a non-vegan. They said: “this is so good. it tastes gourmet. this is the best meal i’ve had in a long time”. so thank you. i looked like a chef. I love you blog. Just had to tell you! My fiance recently got on a vegan diet.. so I have been searching the internet for things to fix him that are still interesting. Your blog has been amazing help and is now on my favorites!! Thanks! I was thinking of substituting hummus for the pine nut spread. Do you think this woudl work? had my very carnivore parents and grandmother over for dinner and they all loved it! My Dad was actually shocked to discover this had NO CHEESE! My Mom asked for the recipe and my Grandma just couldn’t believe I found this recipe on the computer LOL. Next time I’m going to double the pine nut spread – my favorite part. November 8, 2009 - 10:18 pm Nicole L.
Pine nuts are definitely a hit or miss. Maybe next time I’ll try using a fake cheese spread. I don’t opine that every student in the world has got a passion of academic essay creating! However, people ,which don’t have writing skillfulness have to utilize help of great comparison essay writing service and enjoy a success. This is AMAZING!!! We absolutely LOVE LOVE LOVE this dish!!! My question, I don’t have much luck frying things in olive oil – it always ends up smoking! Is there a trick to it?? Or is ther a way to bake the eggplant instead of frying it altogether?? The pine nut spread gives it so much flavor I doubt we would miss the oil!!! THANKS!! YUM! this is what I’ve decided to make with my Valentine this Sunday. Yum! For those who want vegan cheese in it, like me:) I would add Daiya., Vegan YumYum ,what do you think?! Made this tonight. It was so easy and fun to make (as long as you’ve got the time) and really yummy! I added some of the suggested variations like pumpkin and baby spinach in the filling and sundried tomato in the pine nut paste. I would have added some minced garlic to the paste if I’d remembered as I just love garlic and felt it was missing a little something. Instead of the breadcrumbs, I sprinkled nutritional yeast over the top just before eating for a cheesy/nutty taste. I don’t usually eat pine nuts and found them a bit strong (they’re expensive where I live too), so I think next time I’ll use 1/2 pine nuts and 1/2 cashews and see how that goes. I LOVE this recipe. It used to be on my Vegan Yum Yum iphone app but it disappeared for some reason. If the app gets revised, I think it should be included again since it’s not in the Yum Yum book. Big fan of you & your recipes. Even my non-vegan friends and family members love everything I make from your recipes. I am not Vegan but want to cut back on my Meat intake and also want to cut on dairy. Sounds good.